Both special and general relativity have a reputation for being very complicated theories to understand. While it is true that one needs some mathematical machinery to really master these theories, Egdall does a great job in showing that it is possible with a bare minimum of high school mathematics to get an appreciation of the main ideas. Edgall does not completely stay away from some mathematics, though as it is isolated somewhat from the main text, the mathematically shy should not be scared away from this book. The style is lighthearted and is full of thought experiments illustrated by short entertaining stories. The author does an excellent job in highlighting the main features of special and general relativity in a way suitable for the lay reader to understand. Moreover, the development of the theory is presented in a chronological/historical context by trying to describe Einstein’s trail of thought and how he was influenced by the various problems with physics found in the late 1800’s. We get a good overview of Einstein the man from this book. However, like all popular science books, there are the odd statements like “…the photon’s perspective” and “..spacetime curvature has energy” which any physicist will question. That said, I do consider the book well-written, entertaining and a useful introduction to the ideas of relativity for the lay person. The book is divided into two chapters, an appendix with more mathematical details and a rather extensive list of notes with sources. Part I deals with special relativity describing the initial development of the theory starting from the conflict between classical mechanics and electromagnetic theory. The strange consequences of Einstein’s special relativity including the idea of space-time, time dilation, length contraction and his famous equation E=mc^2 are discussed. Part II introduces us to general relativity which is the most accurate theory of gravity know to science. The fundamental idea is that gravity should be viewed as space-time curvature and some of the consequences of this are discussed in this book. Some aspects of modern cosmology and the big bang theory are also briefly discussed. Note: This book is based on lay courses in modern physics Edgall teaches at Lifelong Learning Institutes at several universities in South Florida. 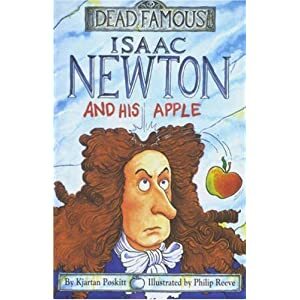 In Isaac Newton and his Apple, Kjartan Poskitt describes in an entertaining and graphic way (illustrations by Phillip Reeve) the life and times of Newton. The book, aimed children 9 and above, described Newton’s troubled life, his not very pleasant demeanor, his feud with Hooke and arguments with Leibniz. The book is scattered with other historical facts that help set the scene of Newton’s life. And of course, it describes his mathematical genius and his catchy titled book Philosophiæ Naturalis Principia Mathematica. Interestingly, Isaac Newton and his Apple does contain a little proper mathematics. The ideas of Newton’s laws and even the dreaded calculus are presented with some mathematics. This should not scare anyone, you can, without spoiling the story too much, skip the mathematics. The general theory of relativity has a reputation of being very difficult to comprehend. This is especially true for the layperson or undergraduate students. Space, time, and gravity: the theory of the big bang and black holes by Robert M. Wald plots a very accessible course through the core phenomena of general relativity without any unnecessary mathematical detail. The book is based on lectures that Wald gave in Chicago 1977. The 1992 version is updated due to the great advancements in observation cosmology since the first edition. The book consists of 10 main chapters, an appendix (in the 1992 edition) and a list of suggestions for further reading. Chapter 1 describes the geometry of space and time from a Newtonian “everyday” perspective. The ideas of spce-time diagrams, the principle of relativity and absolute simultaneity are given here. In the next chapter it shown how these ideas need modifying following Einstein. Chapter 2 introduces special relativity. The principle concepts of Einstein’s axioms, relative simultaneity, the space-time interval, Lorentz contraction and time dilation are neatly presented. Wald emphasises the geometric way of thing which is paraphrased as “it is all in the metric”. With this in mind, geodesics in Minkowski space-time are discussed and the conclusion is drawn in special relativity the space-time is flat . General relativity is the subject of Chapter 3. Wald discusses why Newtonian gravity cannot be directly incorporated in to special relativity. The key trouble is the notion of relative simultaneity and instantaneous interactions. The solution is that equivalence principle strongly suggest that space-time is not flat. Wald then moves on to discuss the Einstein field equations, the bending of light, and the gravitational red shift. Chapter 5 presents a walk through the evolution of the Universe. Evidence for why we think the Big Bang is a good theory is presented here. For example the CMBR and the cosmic abundance of deuterium. Stella evolution up to white dwarfs and neutron stars is the subject of Chapter 6. Wald discusses stellar birth, the continued evolution of stars, teh electron degeneracy pressure and white dwarfs, supernovae and neutron stars. The gravitational collapse to form black holes is the topic of Chapter 7. The basic structure of black holes is presented as is the cosmic censorship hypothesis and the no-hair theorem. Due to the singularity theorems of Penrose and Hawking, and other works it is generally accepted that complete gravitational collapse will always result in a black hole. Chapter 8 discusses the Penrose process of energy extraction from a rotating black hole. Wald discusses the notion of ennergy-momentum in special and general relativity. The complications of what we mean by energy in general relativity are highlighted. The Ergosphere of a rotating black hole is described as is the Penrose process and the energy extraction limits. The astrophysics of black holes is the subject of Chapter 9. Wald discusses the proposed mechanisms of black hole production: collapse of a massive enough star, collapse of a cluster of stars and primordial black holes. Wald then discusses gravitational lensing, gravitational radiation and X-ray sources. Chapter 10 discusses particle creation near a black hole and Hawking radiation. The consequence for conservation laws of black hole evaporation are discussed as is the strong link with thermodynamics. We have learnt a lot since the 1977 edition and also the 1992 edition about observation cosmology and the deep link between black holes and thermodynamics. That said, the book is a wonderful expose to these deep ideas in a way that is rather accessible. As a note, I own the first edition from 1977 and so based the above review on that. From what I can tell the second edition is very similar but the numbers are updated. Quantum field theory is a many faceted subject and represent our deepest understanding of the nature of forces and matter. Quantum field Theory A Modern Introduction by Michio Kaku gives a rather wide overview of many essential ideas in modern quantum field theory. The readership is graduate students in theoretical physics who already have some exposure to quantum mechanics and special relativity. Chapter 1 gives a historic overview of quantum field theory. Topics here include: a review of the strong, weak and gravitational interaction, the idea of gauge symmetry, the action principle and Noether’s theorem. Symmetries and group theory are the subjects of Chapter 2. Topics include: representations of U(1), SO(2), SO(3) and SU(2), spinors, the Lorentz group, the Poincare group and supersymmetry. Chapter 3 moves on to the quantum theory of spin-0 and spin 1/2 fields. The emphasis here is on canonical quantisation. Topics covered here include: the Klein-Gordon field, propagator theory, Dirac spinors and Weyl neutrinos. Quantum electrodynamics is the topic of Chapter 4. Again the emphasis is on canonical quantisation. Topics include: Maxwell’s equations, canonical quantisation in the Coulomb gauge, Gupta-Bleuler quantisation and the CPT theorem. Chapter 5 describes the machinery of Feynman diagrams and the LSZ reduction formula. Topics here include: cross sections, propagator theory, the LSZ reduction formulas, teh time evolution operator, Wick’s theorem and Feynman rules. The final chapter of part 1, Chapter 6 describes the renormalization of quantum electrodynamics. Topics here include: nonrenormalizable & renormalizable theories, the renormalization of phi-4 theory, regularisation, the Ward-Takahashi identites and overlapping divergences. The renormalization of QED is then broken down into fours steps. Chapter 8 introduces path integrals which are now fundamental in particle theory. Topics here include: path integrals in quantum mechanics, from first to second quantisation, generators of connected graphs, the loop expansion, integration over Grassmann variables and the Schwinger-Dyson equations. Chapter 9 covers gauge theory. Topics here include: local symmetry, Faddeev-Popov gauge fixing, the Coulomb gauge and the Gribov ambiguity. The Weinberg-Salam model is the subject of Chapter 10. Topics here include: broken symmetries, the Higgs mechanism, weak interactions and the Coleman-Weinberg mechanism. Chapter 11 discusses the standard model of particle physics. Topics here include: the quark model, QCD, jets, current algebra, mixing angles & decays and the Kobayashi-Maskawa matrix. Chapter 12 discusses anomalies and the Ward identities. Topics here include: the Ward-Takahashi identity, the Slavonov-Taylor identities, BRST symmetry & quantisation, anomalies and Fujikawa’s method. Chapter 12 covers the remormalization of gauge theories. Topics include: counterterms, dimensional regularization and BPHZ renormalization. The modern perspective of QFT is based on Wilson’s renormalization group. Chapter 14 introduces the reader to this concept in the context of QCD. Topics here include: deep inelastic scattering, neutrino sum rules, the renormalisation group, asympptotic freedom and the Callan-Symanzik relation. The renormalization of QCD is presented via renormalization groups methods. Chapter 15 introduces lattice gauge theory which allows questions in quantum field theory to be numerically tackled on computers. Topics here include: the Wilson lattice, scalars & fermions on the lattice, the strong coupling approximations, Monte Carlo simulations and the renormalization group. Topological objects in field theory are the topic of Chapter 16. Topics include: solitons, monopoles, instantons & tunneling and Yang-Mills instantons & the theta vacua. Chapter 17 discusses phase transitions and critical phenomena. Topics covered include: critical exponents, the Ising model, the Yang-Baxter relations, the mean-field approximation and scaling & the renormalisation group. The idea of unification is the subject of Chapter 18. Topics include: unification & running coupling constants, SU(5), anomaly cancellation, the hierarchy problem, SO(10), technicolor, preons & subquarks and supersymmetry and strings. Chapter 19 discusses quantum gravity. This chapter is about attempting to construct a perturbative theory of quantum general relativity. Topics include: the equivalence principle, vierbeins & spinors, GUTs & cosmology, the cosmological constant, Kaluza-Klein theory and counter terms in quantum gravity. Supersummetry is the subject of Chapter 20. Topics covered here include: supersymmetric actions, superspace methods, Feynman rules, nonrenormalization theorems, finite field theories, super groups and supergravity. Chapter 21 introduces the superstring. Topics include: quantisation of the bosonic string, teh four superstring theories, higher loops, string phenomenology, light-cone string field theory and the BRST action. Geometry and topology are now a well established tools in the theoretical physicists tool kit. Topology and geometry for physicists by C. Nash & S. Sen gives a very accessible introduction to the subject without getting bogged down with mathematical rigour. Examples from condensed matter physics, statistical physics and theoretical high energy physics appear throughout the book. However, one obvious topic missing is general relativity. As the authors state, good books on geometry & topology in general relativity existed at the time of writing. The first 8 chapters present the key ideas of topology and differential geometry. Chapter 1 discusses basic topology. Topics include homomorphisms, homotopy, the idea of topological invariants, compactness and connectedness. The reader is introduced to “topological thinking”. Manifolds are the subject of Chapter 2. Topics include: the definition of manifolds, orientablilty, calculus on manifolds and differential structures. Chapter 3 discusses the fundamental group. Topics include: the definition of the fundamental group, simplexes, triangulation and the fundamental group of a product of spaces. Chapter 4 moves on to the homology group. Topics include: the definition of homology groups, relative homology, exact sequences, the Kunneth formula and the Poincare-Euler formula. The higher homotopy groups are the subject of Chapter 5. Topics covered include: the definition of higher homotopy groups, the abelian nature of higher homotopy groups and the exact homotopy sequence. The de Rham cohomology of a manifold is the subject of Chapter 6. Topics include: Poincare lemma, calculation of de Rham cohomology for simple examples, the cup product and a comparison of homology with cohomology. Chapter 7 presents the core concepts of differential geometry. Topics here include: fibre bundles, sections, the Lie derivative, connections on bundles, curvature, parallel transport, geodesics, the Yang-Mills connection and characteristic classes. Chapter 8 outlines Morse theory. Topics include: the Morse inequalities and the Morse lemma. Connection with physics is established via symmetry breaking selection rules in crystals. The next two chapters look at application in physics of some of the ideas presented earlier in the book. Defects and homotopy theory is the subject of Chapter 9. Topics include: planar spin in 2d, ordered mediums and the stability of defects theorem. Chapter 10 discusses instantons and monopoles in Yang-Mills theory. Topics here include: instantons, instanton number & the second Chern class, instantons in terms of quaternions, twistor methods, monopoles and the Aharanov-Bohm effect. The book has also been reprinted by Dover Books in 2011. An Introduction to Noncommutative Differential Geometry and its Physical Applications Approaches to quantum gravity suggest that the very small scale structure of space-time becomes inherently “fuzzy”. This suggestion leads to a new perspective on geometry known as noncommutative geometry. The principle idea is to replace the sheaf of functions on a manifold with some noncommutative algebra and treat this as if it were the functions on some “space”. An Introduction to Noncommutative Differential Geometry and its Physical Applications by J. Madore presents an overview of noncommutative differential geometry assessable to physicists and geometers alike. There are two main approaches to noncommutative differential geometry. The “mathematics” approach is based on Connes’ ideas of spectral triples. The “physics” approach is deformation and quantised coordinate rings. This books focuses on the “physics” approach and Connes’ spectral triples are mentioned in passing. The readership is graduate students and researchers in mathematical or theoretical physics interested in noncommutative geometry and modifications to space-time. The prerequisites are some familiarisation with quantum mechanics and differential geometry. Knowing quantum field theory and maybe some string theory would help motivate reading the book, though this is not essential. Noncommutative geometry is a mathematical subject in its own right. Chapter 1 is an introduction. This chapter gives the basic idea of noncommutative geometry as the reformation of the theory of manifolds in terms of the algebra of functions and then generalise this to more general algebras. The next 5 chapters lay down the mathematics of noncommutative geometry. Chapter 2 gives a review of differential manifolds in the language of the structure sheaf. Topics covered include: differential forms, vector fields, connections, metrics and de Rham cohomology. The reader is expected to be familiar with these topics, but not necessarily formulated algebraically in terms of the coordinate ring. Matrix geometry is the subject of Chapter 3. Matrix geometry can be thought of as a finite dimensional noncommutative geometry and thus all calculations reduce to algebra. One of the main issues in noncommutative differential geometry is how to define differential forms and vector fields. The subtleties are introcuded in matrix geometry ready for more general algebras. Topics include: vector fields as derivations, differential calculi dual to the derivations, differential algebras & universal calculus, metrics and connections. More general noncommutative geometries are the subject of Chapter 4. Topics include: general algebras, quantised coordinate rings, Poisson structures as “classical limits”, topological algebra (operator algebras) and Hopf algabras. Chapter 5 discusses vector bundles and K-theory. Topics here include: classical vector bundles as projective modules, matrix analogues thereof and Fredholm modules. Chapter 6 moves on to cyclic homology. Topics here include: universal calculus, Morita equivalence and the Loday-Quillen theorem. The next chapters take on a more physics flavour. Modifications of space-time are the subjects of Chapter 7. Topics here include: noncommutative space-time and “fuzzy” physics. Chapter 8 discusses some extensions of space-time. Topics here include: the spinning particle, noncommutative electodynamics and Kaluza-Klein theory. The book is full of examples often well motivated by physics. Each chapter contains short notes that point to the original literature and suggest further reading. The book contains a very health set of references that include arXiv numbers where possible. Local Quantum Physics: Fields, Particles, Algebras Quantum field theory is the theory that describes all the known forces apart from gravity. However, the standard approach to quantum field theory via path-integrals is fraught with mathematical difficulties. One mathematical approach is to remove the fields as the primary objects and consider the algebras of observables as the fundamental objects of interest. Local Quantum Physics by Rudolf Haag introduces the reader to the ideas of constructive field theory and algebraic field theory. Haag is a major player in algebraic field theory and this book gives his perspectives on the subject. The main mathematical tools employed in algebraic field theory are nets of c*-algebras. The book does not assume the reader is an expert in operator algebra, though some familiarity with quantum mechanics, quantum field theory and special relativity is a prerequisite. The book is not aimed at experts in constructive or algebraic field theory and so serves as a great introduction to the subject. The reader will be exposed to the main concepts and main theorems of algebraic field theory. The readership is graduate students and researchers in mathematical physics interested in rigorous approaches to quantum field theory. The book may also be of interest to mathematicians working in operator algebra who would like to understand how to make contact with advanced physics. In the following I will be referring to the second revised and enlarged edition of the book. The book is divided into 8 chapters each containing between 3 and 5 sections. Chapter I lays down the background of quantum field theory. Topics here include: basic concepts of quantum mechanics, locality in relativistic theories, Poincare invariant quantum field theory, the action principle and basic quantum field theory like canonical quantisation, free fields and gauge invariance. General quantum field theory is the topic of Chapter II. Here one encounters the ideas of constructive field theory via the Wightman axioms. Topics discussed here include: the Wightman axioms, generating functionals, time ordered functions, covariant perturbation theory via Feynman diagrams, asymptotic configurations and particles, the S-matrix and the LSZ-formulation. The CPT theorem, spin-statistics theorem and analytical properties of the S-matrix are also discussed. Chapter III moves on to algebraic field theory and the algebra of local observables. Topics here include: operator algebras (von Neumann, c* and w*), factors, positive linear forms and states, the GNS construction, nets of algebras of local observables and vacuum states. This chapter discusses the “guts” of algebraic field theory. The next two chapters discuss some of more advanced aspects of algebraic field theory. That is superselction rules and the KMS-states. Superselection sectors and symmetry is the topic of Chapter IV. Topic discussed include: charge superselction sectors, the DHR-anaysis, the Buchholz-Fredenhagen analysis, low dimensional space-time and braid statistics. Chapter V moves on to thermal states and modular automorphisms. Topics here include Gibbs ensembles, the KMS condition, the Tomita-Takesaki theorem, equilibrium states, modular automorphisms of local algebras and nuclearity. Chapter VI discusses the particle picture of quantum field theory. Topics here include: asymptotic particle cofigurations, particles & infraparticles and the physical state space of QED. The interpretations and mathematical formalism of quantum physics is the topic of Chapter VII. Topics here include: the Copenhagen interpretation, the classical approximation, “quantum logic” and the EPR-effect. The final part of the book, Chapter VIII is a concluding chapter which presents a retrospective look at algebraic field theory and presents some future challenges. Topics discussed here include: a comparison with Euclidean quantum field theory, supersymmetry and general relativity. The book presents the challenges faced by gravity, for instance QFT on curved space-times, Hawking radiation and the possibility of quantum gravity. The book contains a healthy bibliography as well as an author index with references. This allows the reader to chase up the original literature, if desired. Supermanifolds are a useful geometric construction with applications in theoretical physics as well as pure mathematics. Supermanifolds: theory and applications by Alice Rogers describes the various approaches to the theory of supermanifolds and presents a unifying picture. Indeed it is not often necessary to specify exactly what definition of a supermanifold one is employing, though subtleties may need handling. The readership is graduate students and researchers in mathematical physics, theoretical physics, differential or algebraic geometry who wish to learn about supermanifolds and their applications in theoretical physics. The power of this book is in the unifying approach and comparison between the different definitions of supermanifolds. Chapter 1 is an introduction and overview. Chapter 2 introduces superalgabra. Topics covered include: superalgabras & their morphisms, super matrices and super Lie algebras. The notion of superspace is the subject of Chapter 3. Topics include: real Grassmann algabras, topology of superspace and complex superspaces. Chapter 4 discusses functions of anticommuting variables. Topics here include: differentiation, Taylor expansion & Grassmann analytic continuation, the inverse function theorem and superholomorphic functions. Supermanifolds in the DeWitt concrete approach are the subject of chapter 5. Topics include: the topology of supermanifolds, the body of a supermanifold and complex manifolds. Chapter 6 discusses more on the geometry of DeWitt supermanifold, though the ideas pass to supermanifolds understood as locally super-ringed spaces. Topics discussed include: functions between supermanifolds, tangent vectors & vector fields, induced maps and integral curves. Chapter 7 presents the algebro-geometric approach to supermanifolds. That is supermanifolds understood in terms of locally ringed spaces. Topics discussed include: the definition of supermanifolds in the language of locally ringed spaces, local coordinates and morphisms. Chapter 8 discusses the different approaches to supermanifolds. Topics include: Batchelor’s theorem, split supermanifolds and a comparison between the concrete and algebro-geometric approach. Super Lie groups are the subject of Chapter 9. Topics include: definitions & examples, super Lie groups and Lie algebras, super Lie group actions and the exponential map. Chapter 10 moves on to tensors and forms. Topics include: tensors, Berezin densities, exterior differential forms and super forms. The subtle issue of integration on supermanifolds is the topic of Chapter 11. Topics include: the Berezin integral, integration on compact supermanifolds, Voronov’s theory of integration of super forms and integration of exterior forms. Chapter 12 moves on to geometric structures on supermanifolds. Topics here include: fibre bundles, the frame bundle, Riemannian metrics, even and odd sympelctic structures. Chapter 13 links some of the supergeometric ideas with supersymmetry. Topics covered here include: the superspace formulation, superfields, supergravity and embeddings. Super Riemannian surfaces are the subject of Chapter 14. Such objects are vital in superstring theory. Topics here include: the supergeometry of spinning strings, supermoduli spaces, contour integration and fields on super Riemannian surfaces. Path integrals on supermanifolds are discussed in Chapter 15. Topics include: path integrals with fermions, fermionic Brownian motion, Stochastic calculus in superspace and Brownian motion on supermanifolds. Chapter 16 discusses BRST quantisation. Topics include: symplectic reduction, BRST cohomology & quantisation. Chapter 17 find applications of supermanifolds to differential geometry. Topics include: differential forms, spinors and the Atiyah–Singer index theorem.